In people at risk of having a heart attack or stroke due to a deadly blood clot, doctors sometimes recommend the use of a retrievable clot-catching device known as an “inferior vena cava” or IVC filter. The inferior vena cava is a large vein in the body that carries blood from the lower body to the heart. When an IVC filter is employed, the ultimate goal is to dissolve the clot before it can get to the lungs and cause damage. Blood clots that reach the lungs are called pulmonary embolisms, and they are deadly when left untreated. Doctors can clear or dissolve these dangerous clots by inserting an IVC filter into the vein. Although IVC filters are designed to be removed, some doctors leave them inside the patient’s body over a period of time – especially in cases where the patient’s risk of suffering a heart attack or stroke is very high. Unfortunately, the very devices designed to save lives have started cutting them short. In 2010, the Food and Drug Administration (FDA), released a notice that it had received 921 reports of IVC filters causing serious complications in patients. The FDA followed up with another safety communication in 2014, in which it outlined possible complications associated with IVC filters. The FDA also warned doctors against leaving the device in place for too long. The IVC filter is not designed to remain in the body permanently. According to the FDA, life-threatening complications can occur when the device remains in place long-term. Patients in several states have filed lawsuits against various makers of IVC filters. Some of the leading defendants in these cases include C.R. Bard, Braun Medical, Johnson & Johnson, Cook Medical, and ALN Medical. Patients have also named doctors in their complaints, alleging that physicians were aware of the dangers of IVC filters but failed to notify patients of the potential complications associated with their use. C.R. 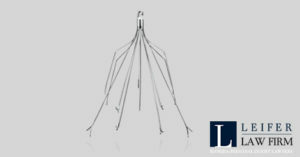 Bard, one of the most prominent manufacturers of IVC filters in the United States, and the maker of an IVC filter linked to 12 patient deaths, has been named a defendant in several lawsuits across the country. As reported by NBC News, there is evidence Bard knew its G2 series filter was defective but continued selling it for five years after it learned the filter had numerous problems, including a tendency to tilt, migrate, and cause perforations in the vein. Bard also chose not to remove an earlier version of the G2 filter – known as the Recovery filter – after learning it had a higher risk of fracture, movement, and death than filters manufactured by competitors. Instead of recalling the defective Recovery filter, reports show Bard simply swapped it out for the G2. Dr. William Kuo, an interventional radiologist and the head of the IVC Filter Clinic at Stanford Health Care, told NBC News he has removed 1,000 defective IVC filters over the past decade, and that the majority of the failed filters were made by Bard. If you or a loved one has been injured by an IVC filter, you may be entitled to receive damages for your injuries. Call a Florida dangerous medical device lawyer to discuss your case today.